A short video set to music featuring many of CLAMP's most popular anime and manga characters (at the time of its production). The accompanying song tells of a Wonderland filled with imagination, magic, and dreams. Clamp in Wonderland is basically a short music video that contains all the characters from the Clamp universe and sticks them in one intertwining world. 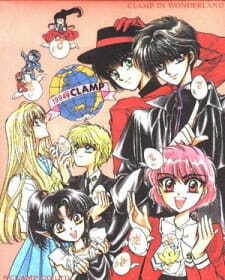 Its a happy and fun little title made from the all female production company known as, well........Clamp! I must say it now......non-existent really. Basically you see Kamui (main lead in a title called X) find this little bouncy ball animal, he gets sucked into a hole there after and the video begins! You don't really see him again, most of the time it will simply just have all the Clamp characters interacting with one another and messing around. From Magic Knight Rayearth, to Miyuki-chan in Wonderland, to Clamp School Detectives. Which ends as a sort of movie like ending, as it turns out all the characters were really watching the video from a music theater. Plot-less yes, but very fun to watch. The character's main goals are to simply entertain you with their antics, and not weave anything else. I feel I should mention again that this video is for characters made before 1996, so don't expect to be seeing anyone from Chobits, Cardcaptor Sakura and the like. There is an updated video called &quot;Clamp in Wonderland 2&quot; which has those in it. Nothing really offensive at all in this title, with the exception of one short moment at the beginning where the camera goes up Miyuki's skirt. But its very brief and never happens again. I have to say that even for an older title, the clarity is pretty grainy, while it does make sense that it should look like that considering its from the 90's. I just can't help but look at it and think that it should have looked a little better. Now the actual character design and art are spot on. They are very well detailed and precise to the show that they come, each one has the exact look and feel from their respected series, so you never get the feeling that one looks out of place. (with the exception of the Rayearth characters, they looked more like their children in this) The backgrounds can range from very well detailed, to nearly nothing at all in the back. So its kinda hit and miss there. Awesome! You get to hear this very catchy j-pop beat sung by Junko Hirotani called &quot;Anata Dake no Wonderland (Your Very Own Wonderland).&quot; Its very memorable, and chances are you will be replaying the video just to hear it again and again. The ending theme (yeah there actually is one) is nice as well, though a bit too low key for my tastes, it just lacks the happiness from the song that plays throughout the title, still quite soothing if you like that style..
Well since none of them talk I simply have to base this on their actions. They do act like their title counterparts, though sometimes I got the feeling that their facial expression would be a little lacking. For most of the video they are either just smiling or serious. I guess there wasn't really much they could do about that with no actual storyline. But they do bring a lot of their style and props from their series. Such as Miyuki-chan being chased by all the Wonderland women, to RG Veda readying itself for battle, to the &quot;X&quot; characters chilling on the Tokyo Tower, which played a big event in its series. If your a Clamp fan or music lover in general, and can get past it's some what poor video quality, then I recommend you trying it out. If you have never seen any of Clamp's series, you can still enjoy it as there isn't a spoiler in sight, and it will most likely make you more interested in their work. A fun happy little video that can be enjoyed by fans and non-fans alike. This is art and best jojo part. Basically you see Kamui find this little bouncy ball animal, he gets sucked into a hole there after and the video begins. What could be better than that? Those super long shoujo legs are the best of the drawing. (Kakyoin wakes up one morning to discover that he had "laid" an egg and reveals it to his friends. When his friends discover this, Joseph asks when his grandson will be born (thus turning Jotaro and Kakyoin as a romantic pair canon for this dōjinshi). The child suddenly hatches out of the egg to reveal a star-shaped birthmark on his shoulder. Thus concluding that Jotaro and Kakyoin produced an egg. Out of courtesy for Joseph Joestar, they name the small boy who hatched out the egg Jota. The child, it would appear grows faster than a normal human and within a week he is able to attend school. Clamp in Wonderland is a gorgeous music video featuring Kamui of, 'X/1999' falling into the rabbit hole of Wonderland~ It's cast with full-colors and a soft mood that's sure to make you smile from ear to ear! If you're a fan of cross-overs, then you definitely have to get on this!! Wonderland is surely the place you visit in this cute animation, a place where you feel like you can touch the stars and taste the sky! Needless to say it's obvious I really enjoyed it~ Clamp's style is so diverse and each character is different throughout art-forms of the the video. You'll meet all of your childhood Clamp favorites, and they'll meet each other, what could be better? You don't need to be a Clamp fan to enjoy this work, but it's alot more enjoyable if you do. I have to say the most beneficial component of this video has to be the fact that you can see many of your Clamp works that were never animated now animated for the first time! However, if you're not a fan of old anime, and old anime style, you should stay away from this one~ It's full of it. Note:this is not a one piece bit but a separation. In other words you have your closing and opening story. Two separate stories/songs in one episode. Sadly neither story had me wanting to spread throughout town knocking on doors to get people to watch this or protest it. I had a very mutual take on it. Opening: Here you have a lot of different characters. A lot of different genres like mech or action that all are being shown. Great and all but the music stays on a romantic note. Which doesn't quite complement all that goes on just some of it. Plus can you really blend comedy with romance? Sometimes but not here. art: i doubt all that art shown was from the same piece i think it came from different show because there was a significant noticeable change in how the backgrounds/ characters were drawn. Conclusion: Story was better suited. Not perfect but better than the opening. The same romantic mood was applied and can work on glum days. Mainly the art suffered here. How the characters walked from background details on water could have been preformed better. Ending Remark: Watch if you are having an off day. It might cheer you up.